To publish a journal which will give broad coverage to and disseminate information on evidence-based research, social welfare, vocational policy, employment, and service provider practice related to individuals with intellectual disabilities in the Asia Pacific region. It will feature content for individuals with intellectual disabilities related to educational policy development, service design, methods and social support systems in the community and school system and organizational and legal structures designed to support individuals with intellectual disabilities. 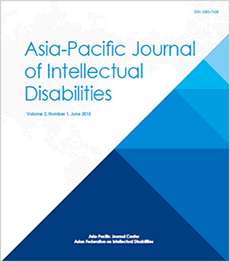 The journal will be the essential professional resource for information about intellectual disability in the Asia Pacific region. It will deliver current research and best practice information, commentary from authoritative experts on critical topics, and a calendar of important events. The journal will be published in the Asian Journal Center (AJC), located in Korea, under the auspices of the Asian Federation on Intellectual Disabilities (AFID).